The Cottage is a traditional 19th century stone-built Highland croft house, sleeping up to six people in two double bedrooms and one single bedroom with extra pull-out bed. 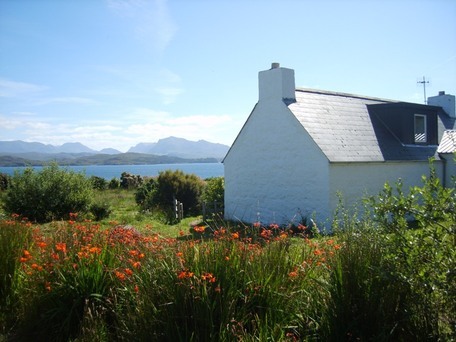 Like its sister property The Lodge, it commands beautiful panoramic views over Loch Ewe and the mountains of the Great Wilderness, Beinn Eighe and Sutherland. The cottage has its own enclosed garden area, plus ample parking and pedestrian access to the loch's pebble shore. Huge sandy beaches are within walking distance, or five minutes' drive. Although carefully restored, the cottage has retained many of its original features and rustic character and is open all the year round.The living room has a compact Aga stove which burns coal or wood, set in the original old stone fireplace. We can supply you with fuel, which is included in the price you pay along with electricity for lighting and supplementary heating. The room has satellite TV/radio and DVD/CD player as well as two small sofas and a coffee table. Free wifi is available and a range of DVDs & CDs is also available for you to enjoy. You can browse through books from Coille Bheag's library, too - many on local history and geography and children's story books to amuse the younger ones in your family. You'll also find some board games, toys and jigsaws. The spacious modernised kitchen/dining room is fully equipped with electric cooker, microwave, fridge with freezer compartment, cupboards, automatic washing machine, toaster and ironing board/iron. There is a dining table and six chairs, and all cookware, crockery, glassware and cutlery is provided. We provide cooking oil, condiments, tea, coffee and sugar, shampoo and shower gel and a copy of the local paper a well as a bottle of wine and some croft produce to welcome you to Coille Bheag. Depending on the season, we may also be able to sell you other fresh produce , such as free-range eggs or vegetables from our surplus. Come for Christmas week, and we'll even decorate a free Christmas tree from our managed woodland to put you in the mood for celebrating! The bathroom is at ground-floor level, and has double glazing, electric wall heater, full-size bath, electric shower, shaver point, washbasin and lavatory. Towels are provided. The main double bedroom is in what used to be the old front parlour on the ground floor, giving easy access for those with limited mobility. It has a king-size iron bedstead and many original furnishings and features. Upstairs there are two further bedrooms - converted traditional sleeping lofts with sloping attic ceilings and double-glazing for warmth. 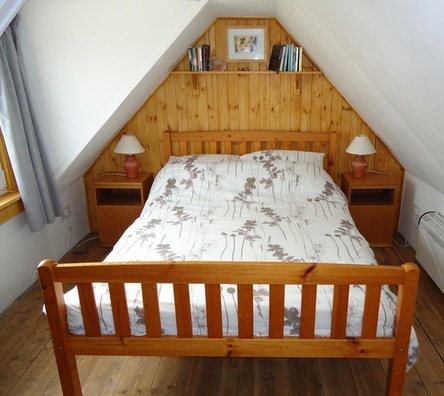 One is a double bedroom and one a single, with a second full-size pull-out bed which we can make up for you if required to make a twin room - ideal for children. The cottage has electric panel heaters in each bedroom. Beds are made up for you when you arrive and there are spare blankets and hot-water bottles should you need them on chilly nights! There is also a heated conservatory area where you can put your feet up and enjoy panoramic views, or enjoy breakfast on a sunny morning.